If you want a fast, capable, and surprisingly comfortable aero bike, then the BMC Timemachine ticks all of these boxes completely. The frame and the fork are composed of carbon. The Timemachine weighs between 7 to 9 kilos, depending on the individual specs. This is an expensive bike. 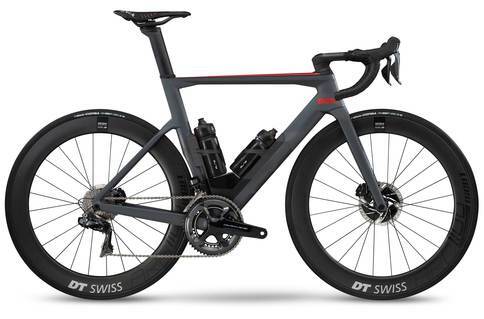 Just the sheer look of the BMC Timemachine is enough to intimidate your competition. This is the kind of bike that has been fine-tuned until BMC was utterly satisfied with the frame and the components that they put together. For this, BMC definitely deserves a nod of approval. This bike is utterly aerodynamic which allows you to get up to some pretty exciting speeds with it. Even if you are combatting some considerable drag or wind, the Timemachine is going to come out on top with ease. It is really ease to get competitive when riding this bike. The other advantage with the Timemachine is that it handles and responds beautifully. You are able to hold steady for long periods of time and can then maneuver the bike with just the slightest of touch. This is an especially good thing because the Timemachine does not handle bumps and disturbances too well. While your bones won’t rattle, it is not exactly going to be the most comfortable you have ever been either. That is not to say that the Timemachine is not comfortable. For a bike that is largely focused on performance, BMC has managed to sneak a couple of features that allows the rider to get comfy. This, in part, thanks to the fact that it is easy to change up your riding position. This helps you to hold on for a longer period of time end elicits fewer groans once you are done with your bike. Yes, you may have to shell out a pretty penny to be able to afford the BMC Timemachine. We felt, however, that it was worth every cent spent. You will definitely be paid back in terms of superb performance. The BMC Timemachine is built for performance and delivers in every sense of the word. This is definitely a bike worth investing in. The BMC Timemachine is ideal for serious riders who want to be able to get the most from any bike that they own.